Mahina means moon in Hawaiian, and the Mahina Cup is a great one for your moon time. The cup itself is pretty standard (comes in two colors and two sizes, made of medical grade silicone, thin, ridged stem for easy removal), the company distinguishes itself by treating your period as a sacred, spiritual time worthy of respect. They observe that the Mahina Cup produces zero waste and is cost effective. It does not contain any chemicals and is pH neutral which is better for your health. If you honor your moon time, a menstrual cup is a great way to take control of your cycle and protect the environment and your body. 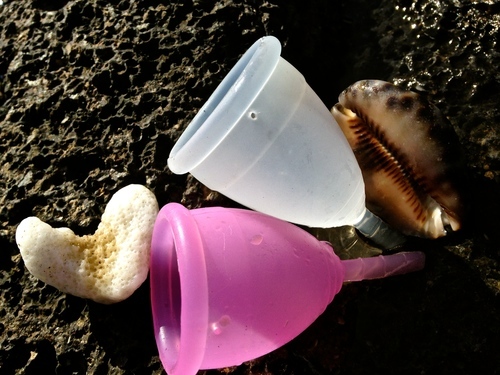 The Mahina Cup is a simple, bell-shaped menstrual cup made of medical grade silicone. It has a thick lip at the top and large airholes just below it. Aside from ridges along the hollow stem, there are no other engravings or ridges on the body of the cup. This cup should be neither easier nor harder to insert than other similar cups. This cup should be neither easier nor harder to remove than other similar cups. The Mahina Cup comes in two sizes: 1 and 2. Choose size 1 if you are under 30 and have not given birth and size 2 if you are over 30 or have given birth. Because the cup has limited ridges and no engraving, it is easier to clean. The Mahina Cup is average cost. While this cup has not explicitly obtained 510(k) certification from the FDA, it is made of FDA-certified medical grade silicone. In addition to menstrual cups, My Sacred Cycle offers a variety of balms, books, and herbs for use during your cycle and to improve womb and menstrual health.